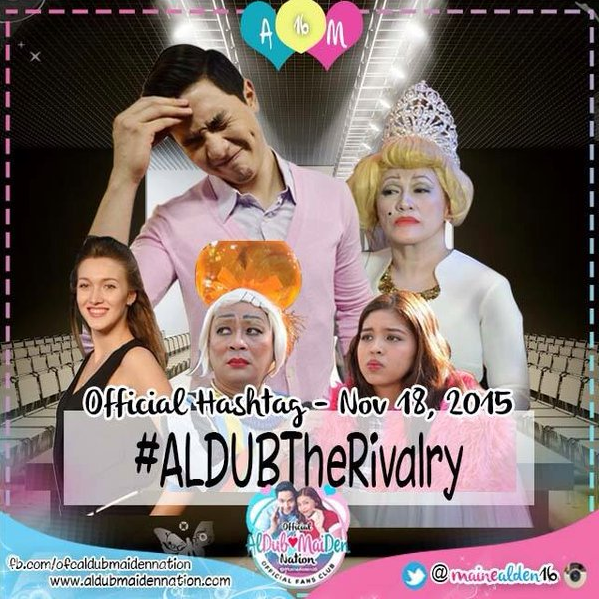 ALDUB The Rivalry episode showed Donya Tidora back in what she loved doing. Prepping up YayaDUB. No apron. Just her hair down and an outfit that looked extra special. Cindy would usually call first before arriving. But Donya Tidora would rather have her grand-niece be ready. If Cindy’s strength is her strut. YayaDUB can strut too. In fact she somewhat chastised YayaDUB for forgetting their modelling lessons. YayaDUB is worried about her skin compared to Cindy’s alabaster skin. Donya Tidora joked around it at ALDUB The Rivalry episode. “Lagyan mo na lang ng powder ang tuhod mo para di maitim.” (Just apply powder on your knees so you’d look less dark.) But seriously, Donya Tidora found YayaDUB’s complexion as pretty. “Maganda naman ang kulay mo. Kayumangging kaligatan. Kaya wag ka maiingit.” (Your complexion is good. The ideal tan. So don’t be envious.) YayaDUB had the kind of skin that Westerners pay for through tanning salons. Donya Tidora emphasized her point by letting YayaDUB try on a blonde wig. As seen at ALDUB The Rivalry episode, it didn’t look natural. She even thought YayaDUB looked a little like Duhrizz. Donya Tidora then enumerated features that made YayaDUB ahead of the competition. “Ganda ng mga mata mo, parang nangungusap. Parang nagda-DUBsmash. Yang labi mo. Yung iba, nagtuturok pa parang magkalabing ganyan.” (Your eyes are beautiful. As if they can talk. As if they could DUBsmash. Your lips. Other people get collagen injections for lips like those.) Donya Tidora even mentioned something at ALDUB The Rivalry episode that the ALDUB Nation knew. YayaDUB had lips that rivaled Angelina Jolie. Luscious and pouty. YayaDUB was told to strut around again. Donya Tidora needed to polish that strut as early as possible in ALDUB The Rivalry episode. Then she told YayaDUB to exclaim in the middle of her strut. “Maganda ako.” (I am beautiful.) YayaDUB did as she was told. Donya Tidora didn’t find her loud enough. YayaDUB had to say it louder. She did. And she was loud enough to get Lola Nidora coming into the living room. Lola Nidora wasn’t upset. But she was paranoid about Donya Tidora talking behind her back again at ALDUB The Rivalry episode. “Sinong maganda?” (Who’s beautiful?) Donya Tidora appeased her sister. “Siempre ikaw.” (Of course it’s you.) Lola Nidora knew her sister a little too well. “Wow, binobola nyo pa ako. Kanina pa ko naghihintay sa labas.” (You’re even flattering me. I’ve been waiting outside.) Donya Tidora had to remind her about upstaging Cindy. So she went along with Donya Tidora’s plan. YayaDUB dared him to strut too like a model. He prepared. Turns out that his background music is “Twerk It Like Miley”. It was okay. The last high profile ramp job he had was at the Cosmo Bash last year. [He was down to his skivvies then.] Later at ALDUB The Rivalry episode, his phone rang. It was Donya Babah. Alden was then heard talking to her. “Hello po, Lola. Wag nyo naman po papuntahin dito. Wala na po siyang aabutan. Trapik po.” (Hello, grandma. Don’t send her here. She wouldn’t find anyone here. It’s traffic.) APEC week still affected traffic so bad. It spurned Senator Tito’s bad memories of his own experience on the road. Alden repeated himself as polite as possible to Donya Babah. “Wag nyo na po papuntahin. Opo, si Cindy po. Wag nyo na po papuntahin. Bakit po kayo nakikipag-meeting sa abogado?” “Don’t send her here. Yes, I mean Cindy. Don’t send her here. Why are you talking with the lawyer?) No barter has been agreed upon between the lost ring and the mortgaged mansion. So Donya Babah lawyered up. Alden is confused. But he didn’t forget to ask Donya Babah not to send Cindy over. Alden begged to talk to YayaDUB. “Mag-usap tayo.” (Let’s talk.) YayaDUB told Alden. “May choice ka, Alden!” (You have a choice, Alden!) Alden kept on begging YayaDUB. 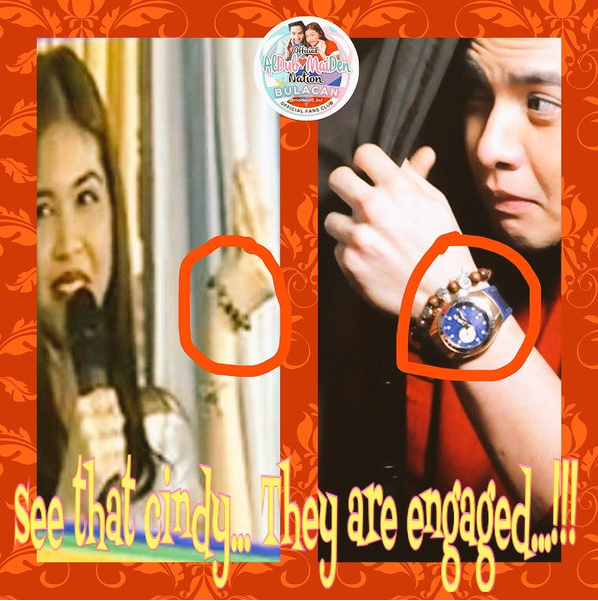 YayaDUB simply said. “I’ve had enough.” Alden was his usual persistent self at ALDUB The Rivalry episode. He begged YayaDUB. YayaDUB then relented. “Mag-explain ka!” (Explain yourself!) Alden then borrowed the words of Notting Hill. “I’ve just a boy standing infront of a girl asking her to love me.” A smile slipped through YayaDUB’s face. Alden then asked YayaDUB anything to make her feel good. “Ano pa gusto mong gawin ko? Anything you want.” (What else do you want me to do?) YayaDUB’s pain was evident in her reply. “Ang gusto ko lang naman, mahalin mo ako.” (All I ever wanted was for you to love me.) Alden asked back. “Hindi ko pa ba ginagawa?” (Haven’t I done it yet?) The KalyseSerye commentary panel sensed the emotion in that last statement. YayaDUB insisted what she saw. “Hindi mo nga inalis yung kamay mo. Kita ko sa replay.” (You did not remove your hand. I saw at the replay.) Every time Alden tried to talk further, YayaDUB would raise her hand. In between, she’d say “I’ve had enough”. Alden wouldn’t budge. “Gusto mo bang puntahan kita diyan?” (You want me to go there?) YayaDUB said. “Sige.” (Okay.) Alden then asked where. YayaDUB just gave a place. “Sta. Maria, Bulacan” Alden pressed for further in formation at ALDUB The Rivalry episode. “Ano address?” (What address?) The KalyeSerye commentary panel had to say “Tama na yan” (Enough) to transition towards the Sugod Bahay segment. Senator Tito was skeptical that Cindy would make it in time at ALDUB The Rivalry. Traffic was THAT bad. Boss Joey thought that Cindy might make it. “Puti yun.” (She’s white.) Some traffic enforcers in Metro Manila are allegedly lenient towards Caucasian looking motorists. Bossing Vic Sotto started drawing the lot to identify the next Sugod Bahay winner. Alden and YayaDUB stopped talking for the meantime as Donya Tidora and Lola Nidora waited. Alden waited for the Sugod Bahay segment to end at ALDUB The Rivalry episode. Then he tried talking to YayaDUB again. YayaDUB’s insecurities was unleashing the worst in her. “Magde-date na naman kayo ni Cindy eh.” (You’d be going out with Cindy anyway.) Alden didn’t like being pushed to someone he didn’t like. “Bakit mo ba siya pinipilit?” (Why are you forcing her to me?) Alden and YayaDUB still fought over this when Cindy finally arrived. Alden ran for cover. The Russian model Cindy Kournikova walked her way backstage at the Broadway Centrum. She asked around for Alden in her Russian accent. “Where iz Alden? Where iz Alden?” Alden hid behind a black curtain somewhere backstage. YayaDUB tried distracting Cindy at ALDUB The Rivalry. “Where iz Alden? Alden iz in Bulacan eh.” Cindy ignored her and helped herself towards the KalyeSerye commentary panel. They weren’t expecting her. Bossing Vic was so perplexed himself that he almost blew Alden’s cover. “Alden? Behind the curtain.” YayaDUB can’t scold Bossing Vic because, well, he’s the boss. Bossing Vic just realized what he said and immediately retracted his statement. Lola Nidora didn’t like YayaDUB’s behavior upon Cindy’s arrival. She told her to let Alden stand up for himself at ALDUB The Rivalry episode. If he can stand up to Lola Nidora, he can stand up to Cindy too. Cindy can’t find Alden anywhere. She called Donya Babah to complain about not finding Alden. Shortly, Alden’s phone rang. It gave away his hiding place at ALDUB The Rivalry episode. It was close to the same spot where he first saw YayaDUB at the ALDUB Battle For A Cause episode. He answered the phone upon seeing it’s Donya Babah. “Hello? Opo nandito po. PInapanood ko lang po siya mag-model. Di po ako nagtatago.” (Yes she’s here. I’m just watching her model around. I am not hiding.) Alden then came out of his hiding spot to face Cindy before Cindy gets him busted. Cindy knew very little Tagalog. Seems like Donya Babah did not teach her enough. She wanted a hug at ALDUB The Rivalry episode. Alden thought a hug is too quick. “Yayakap agad? Just shake hands because you’re very nice.” Lola Nidora had taught him well about fast love hard enough to turn down a model like Cindy. So he just shook Cindy’s hand for YayaDUB to see. But Cindy seemed clueless. “Halikan mo ako.” (Kiss me.) YayaDUB hasn’t even kissed Alden yet because of Lola Nidora. And this Russian model wanted a kiss on the second day she’s at the KalyeSerye? YayaDUB dared another showdown with Cindy. “Gusto mo pakitaan ko yan?” (You want me to show her?) Now that’s fierce! Cindy pretended not to hear YayaDUB. She ranted at Alden in Russian. The only thing clear about what she said was “I will call Lola Babah”. Alden’s frustration, in the middle of his polite nature, came through. “English na yun di mo pa naintindihan?” (I already said it in English and you still don’t get it?) Well that and Cindy’s refusal to be defeated at ALDUB The Rivalry episode. Cindy ranted again in Russian. Again, the only audible thing is “I hate you”. Then she stormed out of the building. YayaDUB was happy to see her go. “Bye bye!” Bossing Vic tried to call Cindy on her way out. “Hoy yung mikropono namin!” (Hey! Our microphone!) The ALDUB Nation present at the Broadway Centrum was so happy. They danced. Allan K then spoke like a beauty pageant host. “And the winner is?” YayaDUB finished Donya Tidora’s statement with “Me! Woo!” Alden was relieved that he didn’t have to say much in sending Cindy away. But he’s worried about Donya Babah. “Baka po magsumbong kay Lola eh. Baka magalit po sa kin yung Lola ko. Baka yung mansion kunin niya.” (She might tell granny. My granny might get angry at me. She might take the mansion.) Lola Nidora doesn’t have a solution in mind either at ALDUB The Rivalry episode. Alden took the opportunity to then ask Lola Nidora at ALDUB The Rivalry episode. “Lola, magpapaalam po sana ako ako 18th weeksary po namin bukas. Ipagpapaalam ko po sana kung puede kaming mag-date ni Yaya.” (Granny, I’d like to ask your permission for our 18th weeksary tomorrow. I would like to ask if I may take Yaya out on a date.) When will Alden call YayaDUB as Divina? At least Donya Babah was polite enough to call YayaDUB as Ursula. She may have thought that it’s YayaDUB’s other name. The truck horn has already sounded off. But Alden continued with his request. “Para po magkausap na kami ni Yaya.” (So that I can talk to nanny.) The KalyeSerye commentary panel had to remind him of that. Will Lola Nidora allow him now that the stakes are higher? Tune in to Eat Bulaga. Monday to Saturday at noontime. Like Eat Bulaga’s official Facebook page to catch ALDUB The Rivalry episode replay. It’s Cindy’s turn to walk out. But not without telling Alden that Donya Babah would learn of Alden’s decision. Has the Cold War finally descended on the KalyeSerye? More episode recaps to come in this page. So follow us on our social media accounts. Like our official Facebook page, The Philippines Web. And follow us on Twitter @pinasamazing. We’d be expecting you.